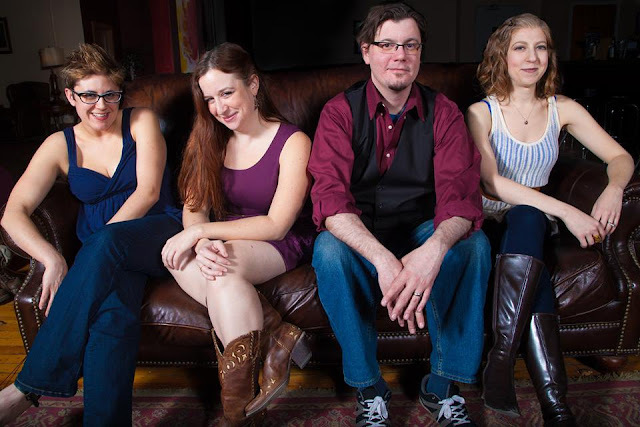 Release: Chicago’s The New Switcheroo have just released their debut EP, Heartless Sky, an album rich in three-part harmonies that nod to Celtic folk, NYC cabaret music, bluegrass, cosmopolitan country and contemporary indie pop. They started as an 8-person project-oriented acoustic folk group comprised of multi-instrumentalists, singers, songwriters, and theatre artists with a deep love for the music we made and for each other, and with a sweet down-home sensibility. Then they evolved, slimmed down and plugged in. They feature sublime vocal harmonies layered over lush instrumental arrangements that create the rich sound you will come to know and love, guaranteed to warm your insides, tickle your fancy, and rock you right out of your boots! R. Thanks for taking the time to chat with R360. How did you get the name The New Switcheroo? It seems obvious, I think. But is there more to it? TNS. Actually, we brainstormed a long list of names, and after about 60 emails between 8 people, it was the only name that nobody hated, that wasn't vetted for meaning something horrible on urban dictionary, and that wasn't already taken. But yes, it's turned out to be rather appropriate. R. Heartless Sky just got released; walks us through the over-all theme, production and lyrics of the EP. TNS. For this EP, we just really wanted to get some of our most solid, best songs out quickly. We've been playing together for years but hadn't yet released any of our original music, and people were asking where they could buy it. It wasn't until after we chose those songs that Kathryn [Diana, violin/mandolin/vocals] realized they all reference the sky in some way, and we ran with it. We're also proud to be a Chicago band, and all these elements are reflected in our gorgeous cover art by Andy Rench. We're an ensemble with no lead singer or main songwriter, and each writer has his/her own writing process (though we're starting to write more collaboratively now). While some bands go into the studio and write an album, we played these songs live, then took them into the studio afterward. We arrange all our songs as a group though, and it's our vocal-based arrangements that are the cohesive element in our music. In terms of production, our goal was to capture our live sound and vibe, which we feel we did successfully, thanks in large part to our co-producer, Tim Radloff. We added extra vocal harmonies or guitar tracks here or there at Radloff's suggestion for how the tracks would sound best from a technical standpoint, but all of the songs can be played live basically as they are. R. What led to the downsizing of the group? Was it a case of too many chiefs and not enough Indians? Did it result in better quality of music? TNS. Most of the original band members come from theatre backgrounds or have other artistic passions and goals outside of the band. We originally formed to do a Christmas project that needed 8 people to fill out the roles. In our first couple years, we were project-oriented with the idea that ensemble members could step in and out for whichever projects they wanted to be a part of or not. When we decided to move more toward being a regularly gigging band playing our own original music, that wasn't for everybody. Claire Feeney, Kathryn Diana, and Joanna P. Lind have been part of every project, and our 3-part harmonies are a main draw for many of our fans and part of what makes us unique as a band. Tim Hill was an original member who, after sitting out a couple projects, came back in for this newest incarnation, superbly skilled on guitar and bass. A smaller group is certainly easier to manage, at times creatively, but especially behind the scenes as a business and logistically. Collaborating in this current lineup is a joy - we're all on the same page, working toward common goals, always getting better, tighter, and more creative with our sound. R. As a group, how do you start when working on a new piece? TNS. It really depends on who initiates it. If one person wrote a song and brings it in, s/he will play it for the group, give us a sense of what direction she/he wants, and we'll arrange it together. Sometimes someone will bring in a lyric, and someone else will set it to music. When we work more collaboratively, someone might bring in an idea for a chorus or a cool guitar riff, and we'll jam on that to flesh it out. We'll spend time in practice trying different sounds, or even different instruments until we're all happy with what we're hearing. No matter where the song comes from, we do all or our arranging as a group. We have band rules in case there are disagreements, and a tie goes to the songwriter - very democratic. R. What are currently your main compositional and production challenges? TNS. Time and money, like for everyone and everything else. Ideally, we'll find and be able to afford a real practice space soon (right now we rehearse in Joanna's living room). Being able to plug in and turn up all the time, have time to experiment more, and write together more collaboratively are all things we'd like to do. We're talking about doing a little band retreat to help jumpstart some new material and continue developing our sound. Then it's just about having the time and funds to get back in the studio to start recording the next batch of songs. R. The group's musical influences range from? TNS. Pretty much everything - we have very broad tastes. Some of us are classically trained, there's certainly some musical theatre in the mix, plus oldies and classic rock that we grew up with, but we also love a lot of what's come out of the modern folk/Americana revival. On any day, depending on the song, some specific influences might be The Band, Fleetwood Mac, Eric Clapton, Nirvana, the Decemberists, the Carolina Chocolate Drops, Hoots and Hellmouth, Dry the River... We like that our tastes are eclectic and that we live in a time when audiences are used to playlists that give them a variety of sounds, so when we do something a little jazzier or a little more indie rock, people take that journey with us. We like that we have elements to our sound that are cohesive that make the music ours but that none of our songs sounds exactly the same. R. Do you prefer the outdoor festivals or the more intimate indoor venues? TNS. We've mostly played indoors to this point. Unfortunately, the way things are booked these days, it's harder to get in on the summer festival stages unless you've played some bigger name venues than we have at present (but we're working on that). When we've played outdoors, it can be challenging because of weather conditions and how the sound dissipates. Indoors we can control the setting more, which is nice, but then we're relying completely on the acoustics of the room and a sound technician who most likely has never heard our style. We have the options to do our more plugged-in sound or go totally acoustic, so it's fun to mix it up. Really, we just like playing for people. R. The role of an artist/group is always subject to change. What's your view on the (e.g. political/social/creative) tasks of artists today and how do you try to meet these goals in your work? 2. If there is more than one idea, try both. 3. If you have a plan, share the plan (communicate). As a band, our task is to make great music that people will enjoy and that says something about our life experiences or the world around us that our audience might connect with. We are all about love (for each other, music, our friends and families, our communities) and authenticity (making music about real things, sung by real people, played on real instruments - not relying on auto-tune or gimmicks). We try, as people and as musicians, to put Good into the world, give back where we can, and encourage participation in helping to make this a better and more just world. I love listening to "Heartless Sky" and the variety of songs. Of course, I have my favorites!